WEST LAFAYETTE, Ind. - Two proteins involved in the process that controls plant growth may help explain why human cells reject chemotherapy drugs, according to an international team of scientists. Researchers from Purdue University and Kyoto University in Japan have shown for the first time that proteins similar to multi-drug resistant proteins in humans move a plant growth hormone into cells, said Purdue plant cell biologist Angus Murphy. Because plant proteins called P-glycoproteins (PGPs) are closely related to human P-glycoproteins that impact chemotherapy effectiveness, discovery of methods to control the plant protein's activity may aid in development of therapies to reduce drug dosages administered to cancer patients, Murphy said. 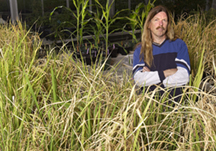 Murphy is corresponding author of the study published in the November issue of Plant Cell. 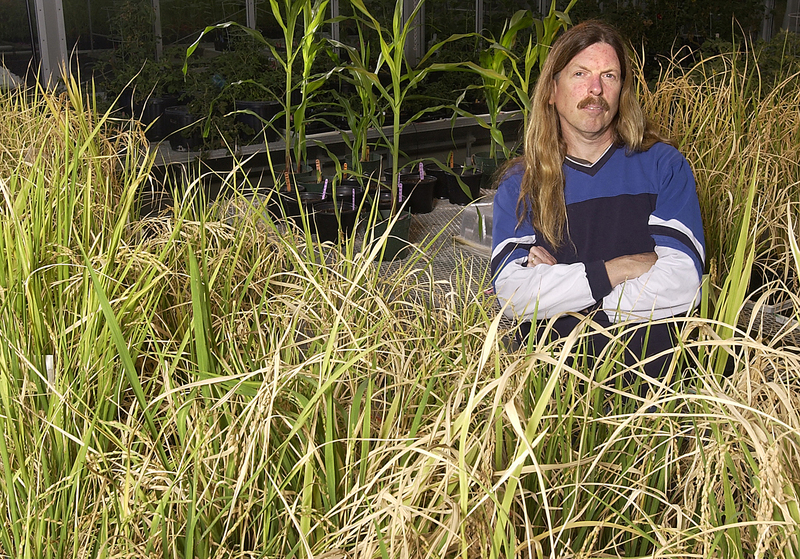 He also is corresponding author of a related article published in October's Plant Journal. "Results of this research will give us a better idea of the functioning of the multi-drug resistance process in which human cancer cells reject anticancer treatments," Murphy said. Results of the two studies suggest a previously unknown relationship between two protein families involved in this process, he said. Working together, the proteins apparently move molecules of the plant growth hormone auxin through cell walls. In humans, related proteins rid cells of toxins such as cancer drugs. "The findings of these two studies have important implications for biomedicine because we now can identify the parts of these proteins that determine whether cells take up or throw off different molecules, such as cancer drugs," Murphy said. In the Plant Journal study, Murphy and his collaborators at the University of Zurich showed for first time that PGP1, a P-glycoprotein from the commonly used experimental plant Arabidopsis, directly transports auxin out of plant cells and also out of yeast and mammalian cells. In the Plant Cell study, they found that other PGP proteins move auxin into cells. "Auxin molecules essentially are pulled through the cell membrane by PGP transport proteins," Murphy said. "It's an energetic process that happens like pulling a rope through something sticky." Both the multi-drug resistant PGPs in people and plants are part of a large family of proteins, called ATP-binding cassette (ABC) proteins, that act as delivery trucks to detoxify cells, send messages from cell to cell to influence biochemical reactions, and to regulate those reactions. The ABC proteins are so named because they must bind with ATP, the main cell energy source, in order to fulfill their mission. The best known member of another class of transport proteins, PIN1, also may be a transporter, but appears to function primarily as an aide rather than the delivery truck for auxin transport, Murphy said. This finding revealed that PINs and PGPs may function together in long-distance auxin transport, according to the Plant Journal article. Named for the pin-shaped appearance of the mutant originally used to identify the gene that directs the activities of PIN1, these proteins are members of the major protein family, called facilators, that aid processes such as hormone transport. Recent evidence suggests that teamwork between PGP and PIN proteins determines the direction auxin moves and, therefore, how the plant develops, Murphy said. In plants, shape, height and bending in response to light and gravity are largely determined by the direction and amount of auxin moving through their tissues. Murphy and his collaborators on the Plant Journal study found that PGP1 and PGP19 move the hormone out of cells. In the November Plant Cell report, Murphy's research team reported that another P-glycoprotein, PGP4, functions in the opposite direction, providing the boost needed to import the hormone auxin into cells and to increase the amount transported. "With these two studies, we've shown for the first time that both the uptake and release of molecules are mediated by interaction between the PGP transporter proteins and PIN facilitator proteins," Murphy said. Other researchers involved with the Plant Cell study were Joshua Blakeslee, Wendy Peer, Boosaree Titapiwatanakun, Anindita Bandyopadhyay, Srinivas Makam, Ok Ran Lee and Elizabeth Richards, all of the Purdue Department of Botany and Plant Pathology; Kazuyoshi Teraska and Fumihiko Sato of the Laboratory of Molecular & Cellular Biology of Totipotency, Kyoto University, Japan; and Kazufumi Yazaki of the Laboratory of Plant Gene Expression, Kyoto University. Teraska, Blakeslee and Titapiwatanakun each contributed equally to the research project and as authors of the journal paper. The U.S. National Science Foundation; the Ministry of Education, Culture, Sports, Science and Technology of Japan; and the Uehara Foundation of Kentucky provided support for this research. On the Plant Journal paper, Markus Geisler of the Basel-Zurich Plant Science Center, University of Zurich, and Blakeslee were co-lead authors and contributed equally to the research; Murphy was corresponding author; and Enrico Martinola, of the University of Zurich, was senior author. The U.S. National Science Foundation and the Swiss National Science Foundation provided funding for the study. Note to Journalists: Proteins are designated by capital letters such as PGP4, while genes are italicized as PGP4 and mutated genes by small letters italicized as pgp4. E-mail: murphy@purdue.edu; fax: +01-765-464-0391; yazaki@rish.kyoto-u.ac.jp; fax: + 81-774-38-3623. 2 These three authors contributed equally to this work. Members of the ABC (ATP-binding cassette) superfamily of integral membrane transporters function in cellular detoxification, cell-to-cell signaling, and channel regulation. More recently, members of the multidrug resistance P-glycoprotein (MDR/PGP) subfamily of ABC transporters have been shown to function in the transport of the phytohormone auxin in both monocots and dicots. Here we report that the Arabidopsis MDR/PGP PGP4 functions in the basipetal redirection of auxin from the root tip. Reporter gene studies showed that PGP4 was strongly expressed in root cap and epidermal cells. PGP4 exhibits apolar plasma membrane localization in the root cap and polar localization in tissues above. Root gravitropic bending and elongation, as well as lateral root formation, were reduced in pgp4 mutants compared to wild type pgp4 exhibited reduced basipetal auxin transport in roots and a small decrease in shoot-to-root transport consistent with a partial loss of the redirective auxin sink in the root. Seedlings overexpressing PGP4 exhibited increased shoot-to-root auxin transport. Heterologous expression of PGP4 in mammalian cells resulted in NPA-reversible net uptake of 3H-IAA. These results indicate that PGP4 functions primarily in uptake of redirected or newly synthesized auxin in epidermal root cells. Directional transport of the phytohormone auxin is required for the establishment and maintenance of plant polarity, but the underlying molecular mechanisms have not been fully elucidated. Plant homologs of human multiple drug resistance/P-glycoproteins (MDR/PGPs) have been implicated in auxin transport, as defects in MDR1 (AtPGP19) and AtPGP1 result in reductions of growth and auxin transport in Arabidopsis (atpgp1, atpgp19), maize (brachytic2) and sorghum (dwarf3). Here we examine the localization, activity, substrate specificity and inhibitor sensitivity of AtPGP1. AtPGP1 exhibits non-polar plasma membrane localization at the shoot and root apices, as well as polar localization above the root apex. Protoplasts from Arabidopsis pgp1 leaf mesophyll cells exhibit reduced efflux of natural and synthetic auxins with reduced sensitivity to auxin efflux inhibitors. Expression of AtPGP1 in yeast and in the standard mammalian expression system used to analyze human MDR-type proteins results in enhanced efflux of indole-3-acetic acid (IAA) and the synthetic auxin 1-naphthalene acetic acid (1-NAA), but not the inactive auxin 2-NAA. AtPGP1-mediated efflux is sensitive to auxin efflux and ABC transporter inhibitors. As is seen in planta, AtPGP1 also appears to mediate some efflux of IAA oxidative breakdown products associated with apical sites of high auxin accumulation. However, unlike what is seen in planta, some additional transport of the benzoic acid is observed in yeast and mammalian cells expressing AtPGP1, suggesting that other factors present in plant tissues confer enhanced auxin specificity to PGP-mediated transport.